The breakout that began as a rupture from the tube supplying the June 27th lava flow continues to advance slowly to the northeast and has reached the forest. While the front of the flow is about 3 km (1.9 miles) from Puʻu ʻŌʻō, it has a long way to go to catch up to the surface flows that have persisted for the last several weeks about 3 km (1.9 miles) farther to the northeast. 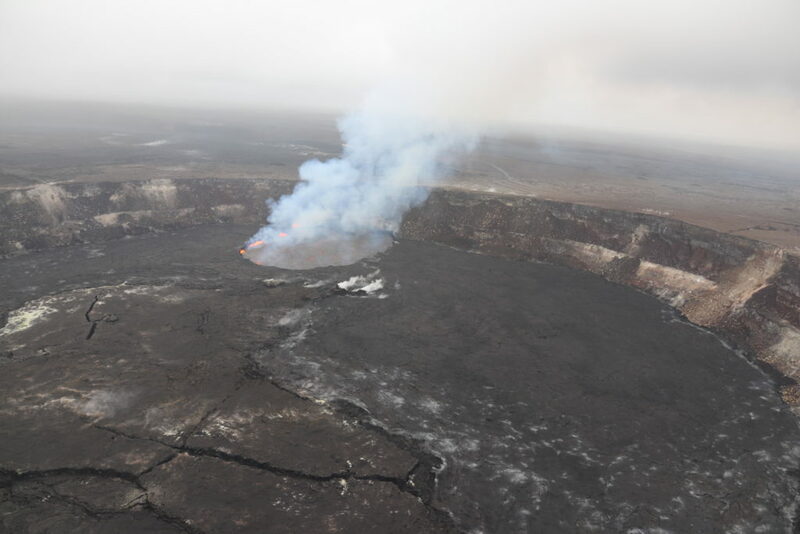 A new vent opened on the northeast flank of Puʻu ʻŌʻō during the first week of December. This is the incandescent, fuming trio of holes just below and to the left of center in the accompanying image. 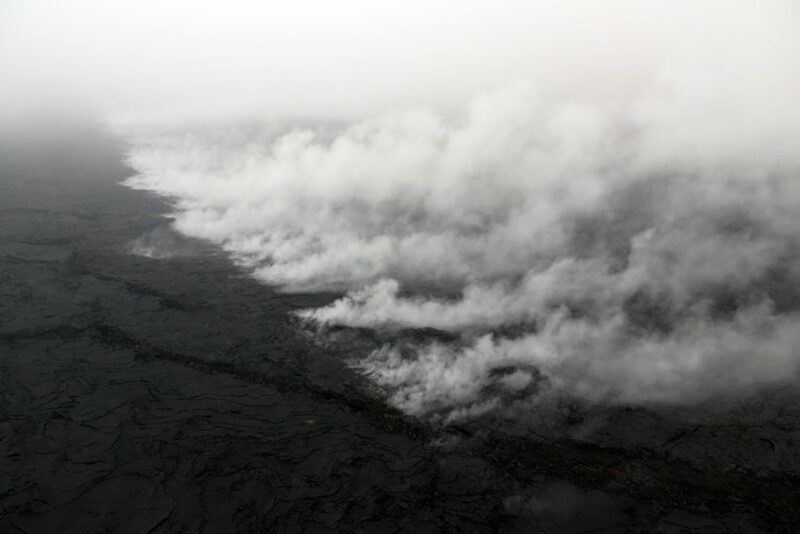 While this spot happens to coincide with the trend of a tube that was last active in early 2014, aerial views into the opening suggest lava is welling up from below and not “flowing” like lava in a tube (there is no apparent lava reappearing downslope). Thus, our current interpretation is that this is a new vent that happened to open into the area of this abandoned tube as lava worked its way to the surface. Our interpretation may change, however, as our view into the vent improves, assuming that the opening continues to widen. This is a view of the new vent from the ground, showing the thin roof that caps the brightly incandescent cavity below. Views from the air show the cavity to be much larger than the current opening, probably extending at least as far as the sulfur staining in the foreground and back under the mound to the right. Right: A bubbling lava surface could be seen about 5 m (16 ft) below the opening of the new vent when viewed from the air. The size of the opening will likely grow with time, as the narrow septa between the individual holes collapse. High aerial view of Puʻu ʻŌʻō, looking south-southwest. The current crater at Puʻu ʻŌʻō is about 280 m (~920 ft) long and 230 m (~755 ft) wide, with a depth of about 25 m (~82 ft). To the west of the crater is another pit 49 m (~161 ft) across that contains a small lava pond. The pit west of the Puʻu ʻŌʻō crater, shown here, is overhung on most sides and may continue to widen with time. The lava pond inside is relatively placid, appearing as a black surface, usually with a few tiny spattering areas along the edge. 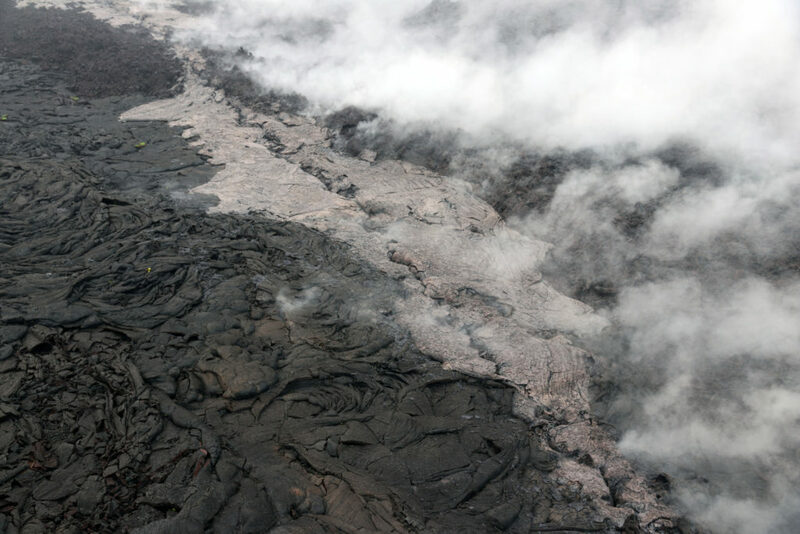 Lava flows are scattered across a broad area extending from about 3 to 8 km (2–5 mi) northeast of Puʻu ʻŌʻō. The active flows start just above the horizontal mid-line of the photo, but cannot be picked out easily within the broader inactive flow field due to their distance away in this photo. The most distant active lava is burning forest, and the bluish smoke from this can be seen in a few areas in the distance, partly shrouded by clouds. Breakouts are active in three general areas near Puʻu ʻŌʻō: at the northern base of Puʻu ʻŌʻō, north Kahaualeʻa, and about 6 km (4 mi) northeast of Puʻu ʻŌʻō. 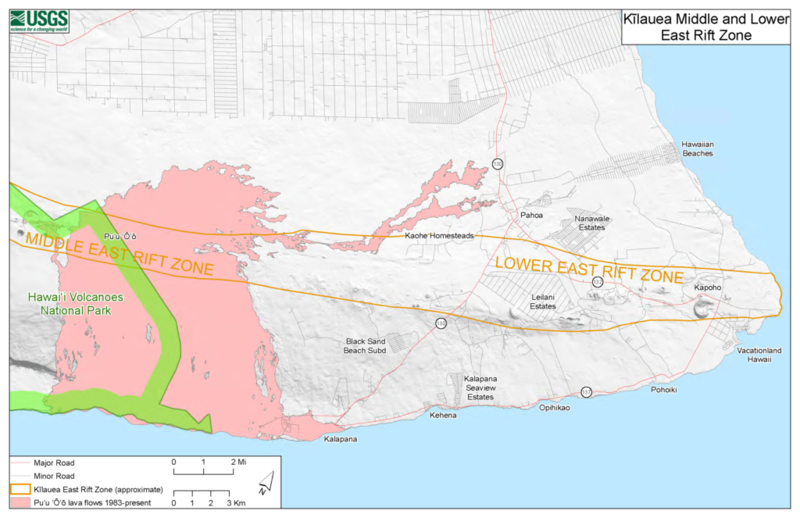 The distal breakout and the breakout north of Kahaualeʻa are both burning forest. There is no eruptive activity downslope from the distal breakout (nothing active near Pāhoa). There are several incandescent and outgassing hornitos on the floor of Puʻu ʻŌʻō’s crater, including the one shown here, which is at the northeast edge of the crater. Recent flows from the hornito appear black.